More than 1000 West Australians visited the anti-submarine warship on Australia Day, when it was open to the public. Commanding officer of ITS Carabiniere, Francesco Pagnotta was overwhelmed by the public response. “We didn’t expect such an influx of people…and they weren’t just Italians, there were Australian people too and this made us really happy that these people wanted to spend their public holiday on board Italy. Because a military navy always has a piece of soil of the flag that it carries, therefore our Italian Navy ship is a piece of Italy”. First Counsellor Pier Luigi Gentile, Deputy Chef de Mission from the Italian Embassy in Canberra was also overwhelmed by the momentous occasion and shared how he hoped this visit would strengthen the already strong ties between Italy and Australia. “In Italy, the sea has always not been seen as a barrier, but a bridge and part of this bridge are ships” he explained. “Many Italian migrants after the Second World War were crossing this bridge and finding a new country and a new life in Australia…this ship that arrives today is another bridge. It is a bridge to establish stronger relations…this is an opportunity to know each other better, to bridge new partnerships…I really hope this bridge will prove to be as effective and friendly as the first bridge made by ships that brought Italian migrants here after the Second World War”. Italian Consul General in Perth. Dr. David Balloni was beaming with pride at the festivities held at the Fremantle Maritime Museum to honour the eve of the departure of the ITS Carabiniere. “Tonight we celebrate new relations between the people of Western Australia and the people of Italy, tonight we celebrate the official opening of a new bridge between this state and Italy. Tonight Italy and Western Australia are closer than ever”, he proclaimed. The ITS Carabiniere also holds a special piece of Italian history on board. Tucked away in a glass cabinet in one of the dining rooms is a Carabiniere hat and belt that belonged to Italian World War Two hero Salvo D’Acquisto. D’Acquisto was a member of the Italian Carabiniere during the war, and heroically sacrificed his own life in order to save 22 civilians from German troops. The ship’s Godmother is D’Acquisto’s niece, Liliana. The 144-meter anti-submarine warship was designed and built for the Italian navy by renowned shipbuilding company, Fincantieri who have been shortlisted by the Australian Government under the SEA 5000 – Future Frigate Programme to deliver nine vessels for the Royal Australian Navy. 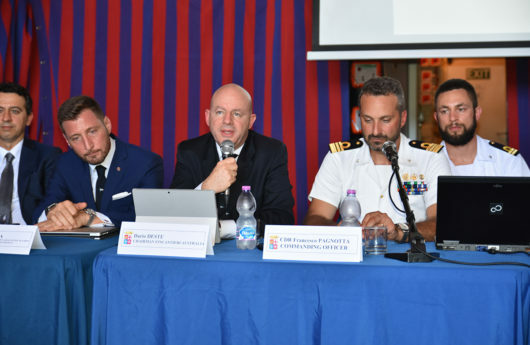 The month-long Australian visit is an opportunity for Fincantieri to showcase the strengths and qualities of the vessel to the Royal Australian Navy. After Fremantle, the ITS Carabiniere will then sail off to Adelaide, Sydney, and Melbourne.